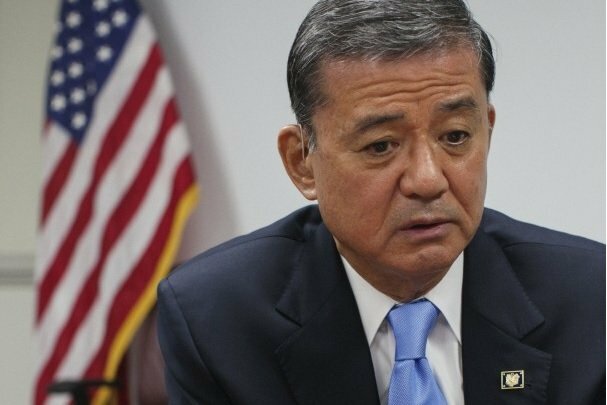 Veterans Affairs Secretary Eric Shinseki has resigned amid a scandal over delayed care and falsified records at the agency’s hospitals. President Barack Obama said Eric Shinseki told him he did not want to be a distraction as the agency tried to fix Veterans Affairs (VA) hospitals. Barack Obama said he accepted the resignation “with considerable regret”. A recent report found veterans at an Arizona hospital waited an average of 115 days for an initial appointment. On Friday morning after an Oval Office meeting with Eric Shinseki, a retired four-star general wounded in Vietnam, Barack Obama told reporters Shinseki had “worked hard to investigate and identify the problems with access to care”. “But as he told me this morning, the VA needs new leadership to address them,” Barack Obama said. Eric Shinseki’s decision to step down came as his support among Barack Obama’s own Democratic Party steadily eroded. Republicans in Congress and at least one major veterans group had called for him to step down earlier this month. The president said he had named Deputy VA Secretary Sloan Gibson to be acting head of the agency. Eric Shinseki’s resignation is the culmination of months of tumult at the agency over reports that administrators at a hospital in Phoenix, Arizona, had falsified records to hide a lengthy backlog of veterans awaiting care. On Wednesday, an internal VA inquiry revealed veterans in Phoenix waited an average of 115 days for a first appointment, but the hospital reported to the agency an average wait time of only 24 days. The VA inspector general’s report also said at least 1,700 veterans were not even on official waiting lists because they had not been properly registered. Barack Obama acknowledged the misconduct was not limited to Phoenix but had occurred in VA facilities across the country. “It’s totally unacceptable,” he said on Friday. Eric Shinseki had begun sacking senior officials at the Phoenix hospital, and has also cancelled bonuses for top VA executives and ordered the agency to contact any veteran in Phoenix waiting for care. The US veterans health system serves about nine million former US military service members. Its resources have been strained by the ageing population of Korean and Vietnam War veterans as well as the large influx of wounded Iraq and Afghanistan veterans.